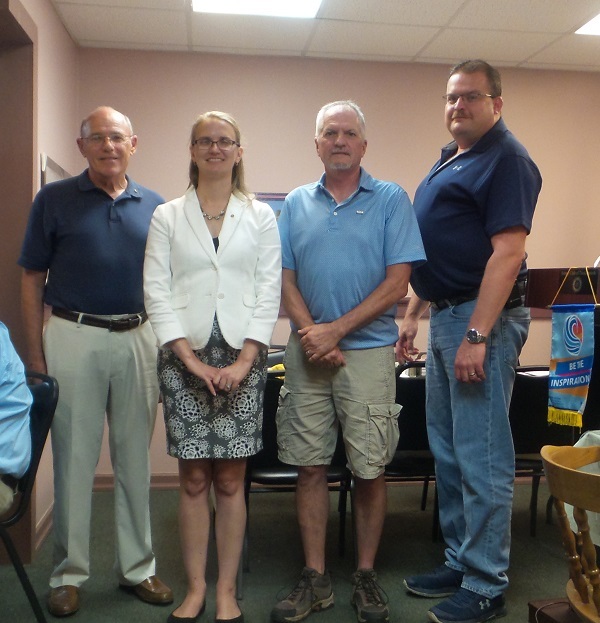 At the Aug 16 Tunkhannock Rotary Luncheon at Purkey's Pink Apple, Wyoming County Chamber of Commerce President, Gina Suydam, was inducted into Rotary by Membership Chair Ron Furman. George Gay was Gina's sponsor, who pinned her with her new Rotary pin. Pres. 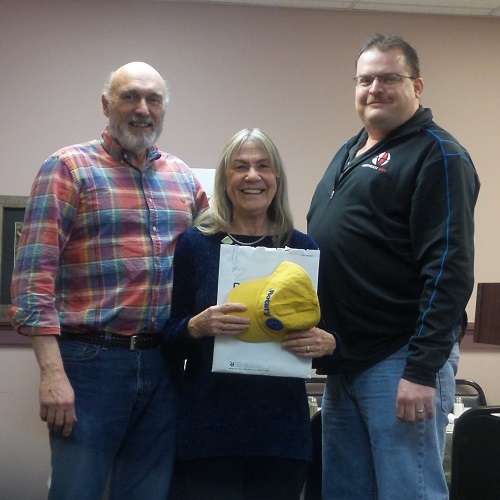 Mike Markovitz then presented Gina with her membership packet and her yellow Rotary hat to be worn at outdoor Rotary events. At the Sept 27 Tunkhannock Rotary, Tony Sykes was inducted into Rotary by Membership Chair Ron Furman. Harry Sharpe was Tony's sponsor. Pres. 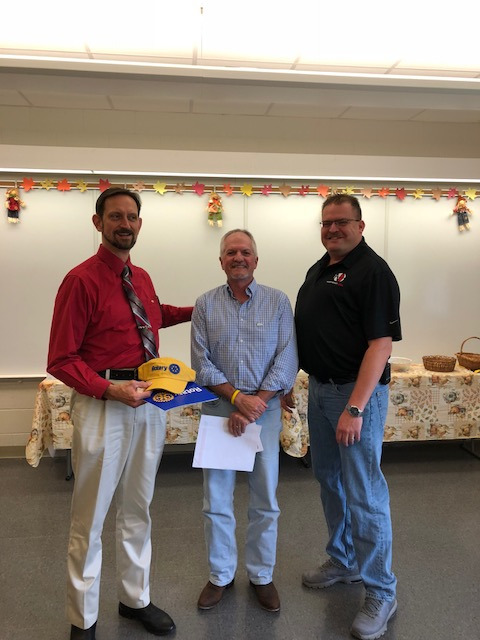 Mike Markovitz then presented Tony with his membership packet and his yellow Rotary hat to be worn at outdoor Rotary events. 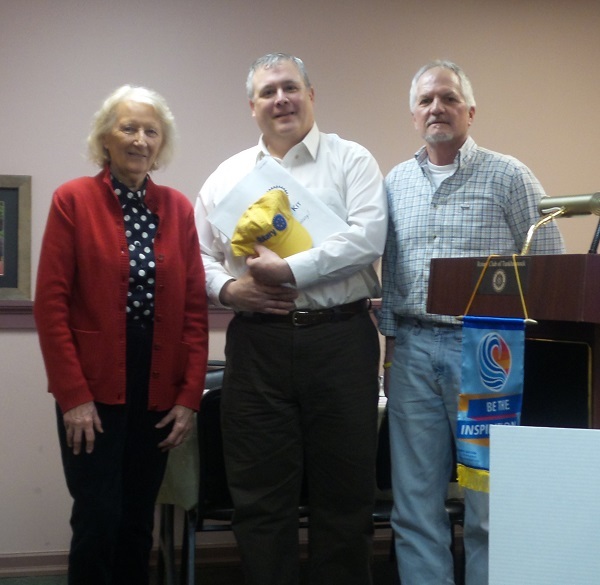 At the Dec 27 Rotary Luncheon, Dory Browning was inducted into Tunkhannock Rotary by Club Membership Chair Ron Furman. Dory was sponsored by Ruth Gorski. Dory is the Executive Director of the True Friends Animal Welfare Center, which is a 501(c)3 non-profit, no kill shelter serving as a safe refuge for animals in need. 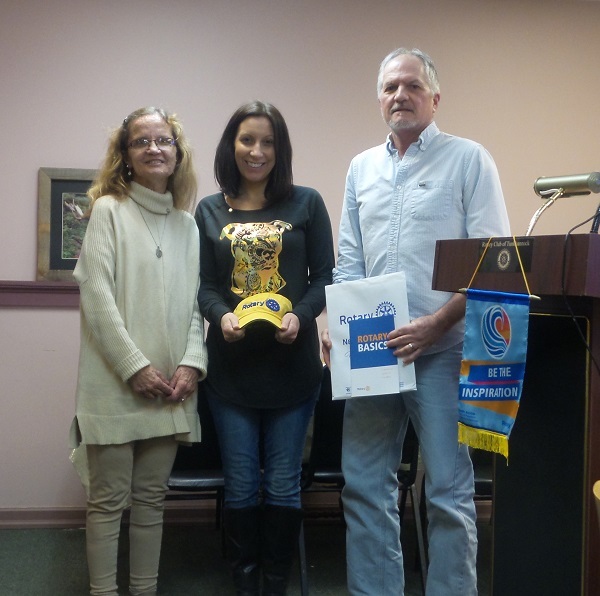 She was recently a guest speaker at one of our Rotary meetings. In lieu of a traditional speaker's "thank you" gift, club members presented Dory with animal food and items for the shelter. 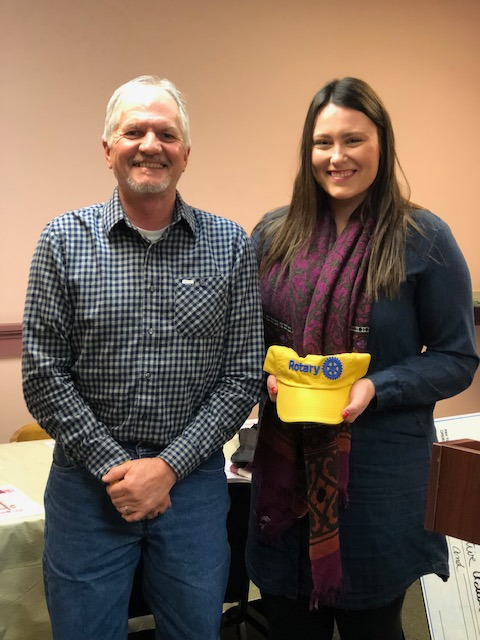 At the Jan 3, 2019 Tunkhannock Rotary Luncheon, club membership Chair Ron Furman inducted Chelsea English into Rotary. Chelsea was sponsored by Ron Furman. Chelsea is the marketing manager at SERVPRO of Kingston, Pittston City and Wyoming County. She has a Bachelor’s Degree in Corporate Communications from The Pennsylvania State University Wilkes-Barre Campus. At the Jan 10 Rotary Luncheon at Purkey's Pink Apple, Pres Michael Markovitz inducted Mary Martin as our newest Tunkhannock Rotarian. George Gay was Mary’s sponsor, but in George’s absence Mary was pinned by her husband Past President Bill Barber. Peter and Anne have 3 children, all of whom have been Rotary outbound exchange students. The Sehne's have hosted several inbound exchange students and entertained many of our District Exchange students. Peter commented that he really enjoyed interacting with the exchange students and now wanted to give back. For the last 17 yrs, Peter has been a prison guard at the Waymart Facility. 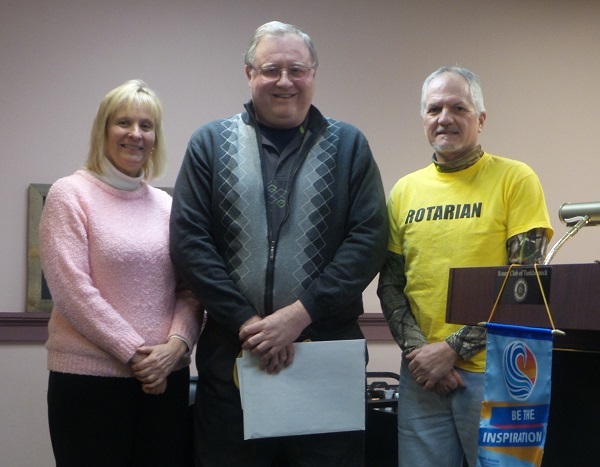 At the Feb 7 Rotary Luncheon, Club Membership Chair Ron Furman inducted David Kuffa into Rotary. Marta Kovacs-Ruiz was David's sponsor. David and his wife Jill have been married for 25 yrs. His daughter Dana is at Temple Univ. studying Sociology. Dana participated in RYLA and was an exchange student to Chile in 2016-2017. The Kuffa family also hosted Stefano Sica during 2016-2017. They have hunting dogs and Stefano was afraid of dogs, but now he has his own dog in Italy. David is an IT consultant at the Refill Station in Clarks Summit. He studied at the Art institute of Philly. He is a musician, song writer and videographer.